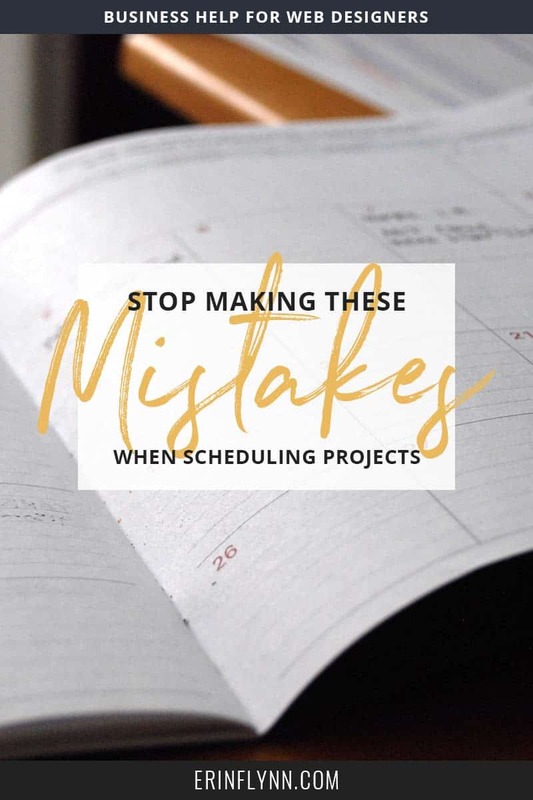 Stop making these project scheduling mistakes! Scheduling projects is an art form. Schedule correctly and you’ll be making good money with plenty of free time to enjoy your life. Schedule incorrectly and you’ll be ripping your hair out while you down six pots of coffee and work through the weekend. That might be a bit of an exaggeration, but not much. Many freelancers and entrepreneurs tend to overbook or improperly book themselves, and can end up working in excess of 80 hours a week. That’s fine for a limited time if you want to rake in some money, but it’s not sustainable and you’ll burn yourself out if you keep it up for too long. Overbooking isn’t the only mistake you can make when scheduling projects, in fact, you can end up with those 80-hour weeks without overbooking at all, if you schedule your project incorrectly. And that’s not fun, since you’re not even getting paid enough to make it worthwhile. Here are some common project scheduling mistakes that you should avoid. Wait, what’s wrong with diving into a project immediately? Well, a few things. First, having immediate availability trains clients to believe that you’ll always be immediately available. They’ll expect you to be able to drop whatever you’re doing at any time and work for them. That’s not a good habit to encourage. Six months from now when your client comes back to add something to their site, you might be busy with other projects, on vacation, or trying to work on some passive income. If you’re not immediately available like you were the first time, the client might get a little cranky, and that’s no good. It’s better to always have at least a slight delay on starting a project (as long as it’s not an actual emergency) in order to set expectations for those times when you are not immediately available. Second, just because you’re ready to go, and your client thinks she’s ready to go, doesn’t mean y’all are ready to go. There are things to take into account, that you and your client need to do before the project actually starts. For example, if you’re building a website, your client probably needs to get their text copy and photos together before you start, so you’re not waiting on those pieces in the middle of the project. And you may need to do some research into the client’s industry, or explore code or plugin options for special features that you know the client wants. Third, it actually looks bad to be TOO available. It looks a little desperate when you see someone posting in Facebook groups or all over Twitter about their immediate availability. It makes you wonder, “Why aren’t they booked? Are they no good?” and that is not the thought we want potential clients to have about us! When you have several potential clients wanting to hire you at once, it can be temping to take them all on. If you don’t, they might go somewhere else and you’ll lose out, right? But there are too many problems that can arise from taking on too many projects. It’s rarely worth it. When you work with too many clients at once, you lose out on things like sleep, weekends, and often, lunch. It can be really bad for your health, and that can make you sick, which could prevent you from even being able to finish the projects at all. Ack! Now, you can choose to forego your health and possibly your sanity in exchange for money and building your business. You’re an adult, make your own decision. But be aware that over-booking and over-working can lead to serious health problems. Besides being bad for you, taking on too many projects can be bad for your clients. When you’re only working with a few clients, it’s easy to remember what you’re doing, what each client wants, and to pay attention to them. Working with too many clients means each client gets less personal attention, and you’re likely to get confused about what you’re doing for each client. In the end, the clients may not be happy with the level of service they were provided or the quality of the end product. It’s better to have fewer happy clients, than to have many unhappy or unimpressed clients. When starting a project where you need client feedback, or collateral from the client (photos, copy, etc.) it’s important to make it clear before the project begins that the client will need to be responsive throughout the project. That means if a client has a vacation scheduled in the middle of the project, you need to know about it before the project begins so that you can plan accordingly. If the client is unable to meet the response times you need them to, they may be a bad fit for working with you. If you need responses within 24-48 hours, and a client takes a week to respond, the project will drag on and on and start to overlap with other projects. Be very clear what you expect from the client in terms of availability throughout the project, and have them agree to the commitment before either of you signs a contract. This is something that you can outline and explain in your intro packet. If you don’t make a timeline, how will you know if you’re on track? Mapping a timeline for each project is an important step. This can be hard to do if you’re just starting out, but after you have a few projects under your belt, you’ll know approximately what needs to happen and when. Knowing what each person is doing at each stage of the project lets both of you know what is expected, and helps you stay on-track. Whether you share this full timeline with the client or not (I recommend you do in your intro packet), you may also want to create your own more-detailed timeline for each individual project so that you can fill in the nitty-gritty details for your own reference and know exactly what you’ll be doing at each stage. But you can use this timeline to get started! The timeline is great, but sometimes you might miscalculate how long you actually need to work on a task. An addition of a new opt-in could take additional time that you didn’t plan for, if you also have to help your client create a new list or segment in their mailing list provider. Or you may get into a website and think you just need to change out the theme, but the website is a disaster and needs some serious plugin cleanup and optimization. Or maybe you just miscalculate how long it’ll take the code that feature your client wants. It happens. As you do more and more projects, you’ll get a better understanding of how long things take. Use a timer to track how long you spend on each task, so that you can get a good average for how long specific tasks take. And always, when you’re estimating how long something will take, add in extra time. A popular method is estimating the time, then multiplying your estimate by 1.5 to account for any hiccups along the way. Since you’re not pricing on an hourly rate (right? ), this method doesn’t hurt your client, but allows for any extra time you need to spend if a task takes longer than you thought it would. Like allowing extra time for tasks, allowing extra time for projects prevents there from being too much overlap. During the course of the project you may run into problems, the client may delay things, you may get sick, or the scope may change. Creating a “buffer” makes all of this okay! How much of a buffer you need really depends. Two weeks is a good amount of time for most projects, ranging from 4-8 weeks in estimated length. It’s unlikely that the scope or delays will extend the project past these two weeks. But if it’s a very large project, which you estimate to take 12 or more weeks, adding in a buffer of 3-4 weeks may be more appropriate, as the longer a project is, the more opportunities for delays or scope increase. The nice thing about scheduling in a buffer is that if the project uses it up, you’re not stressed because the next project isn’t affected by overlap. But if the buffer isn’t needed, you can either move the next project up, or take a much deserved vacation without feeling guilty. Scheduling projects poorly can have a negative impact on you, your business, and how happy your clients are with the the end product. While it can be tempting to over-book yourself, it’s important to not schedule more than you can reasonably handle. You don’t want to risk your health or make your clients unhappy because they are not getting the attention or service that the deserve. Starting projects immediately can make you look a little desperate, and will train clients to always expect immediate availability–which you won’t always have. Try to schedule at least two weeks out to allow time to get everything together, and set good availability expectation for your clients. Be clear with clients about how much they’ll need to be available, and what the expected response times from them will be. If they are not able to commit to the timeline and response times that you outline, your scheduling will be thrown off. Remember to make your own timeline for each project so that you can stay on top of what you need to be doing. Finally, over-estimate for both individual tasks and overall project timeline. Giving yourself more time than you think you need allows for any potential hiccups to be taken care of without stress, and even for scope increase (with payment, of course!) if needed. What changes will you make to improve your scheduling?